From contemporary to classic, the choice is yours when it comes to creating your interior design! 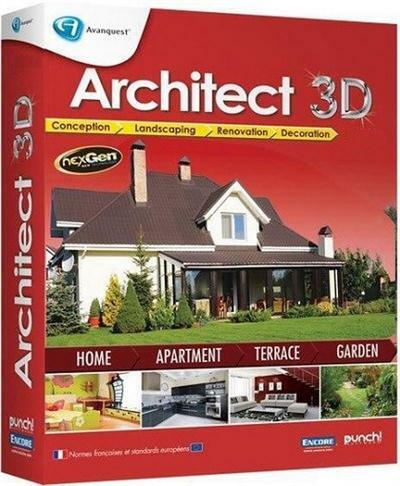 Architect 3D allows you to give free rein to your imagination and design your home in simple steps. Equip each room in your house or apartment: living room, dining room, kitchen, bathroom, bedrooms, etc. Select and arrange your furniture, lighting, cabinets and other items with just a few clicks of your mouse. Use professional tools to decorate your home from floor to ceiling! The Architect 3D technology allows you to easily experiment with different colours, floor coverings (tiles, carpet, wood, etc.) and wallpapers. Wizards help you to select your furniture from a library of more than 3,500 objects, or you can design your own furniture from scratch. Decorate each of the rooms in your house as if you were actually there! Use the customisable Decorator's Palette to experiment with different colours and textures for your walls, floors or even your furniture! Select and save your choices to the palette and use them as required in your rooms. Select your cabinets, friezes, base trim, crown trim and fireplaces from a wide range of samples. Then change the colour, sizes, etc. as required. Coordinate your fireplaces, cabinets and finishes to match the rest of your decoration. Whether you are constructing or renovating, the PhotoView 3D technology gives you an even more realistic rendering. Insert and edit your own images with a click of your mouse. Change the colours of doors, facings, walls, etc. - Compatible with new Sketchup formats and it's easier to edit objects within the program. - Easily add shutters that automatically size to your ShiChuang.